Bicycle Opera and Toy Piano Composers are gearing up for Travelogue, four new operas that explore travel by bicycle, car, and rocket ship. Week two of Travelogue Composer Q&A features August Murphy-King, the composer of My Mouth on Your Heart with librettist Colleen Murphy. And if you’re wondering…yes, they are related. 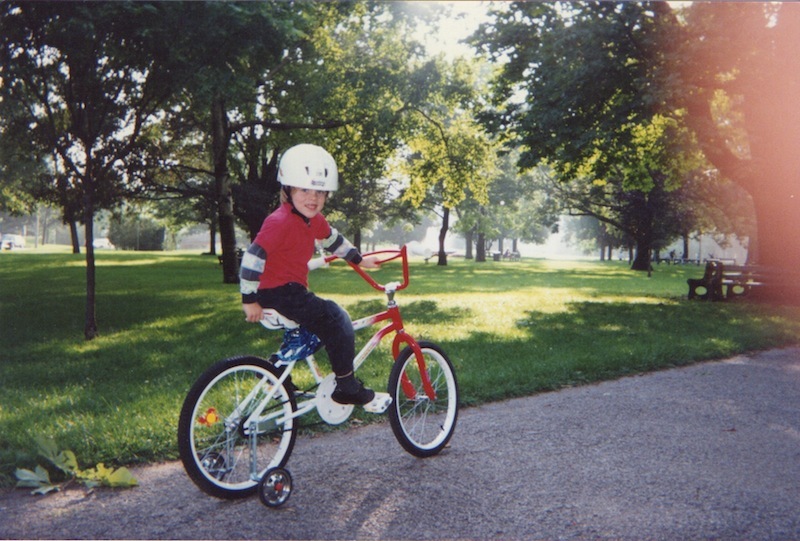 My first two-wheeler (with training-wheels of course) in Queen’s Park and possibly my first bike ride ever! What is My Mouth On Your Heart about? It is about life, death and love. The main character, Liam, travels to the side of the highway where his girlfriend, Anna, died when a drunk driver smashed into her car. Anna’s pointless death has left Liam in anguish. Standing alone on the highway, clutching a flower, he finds himself travelling back and forth between Life and Death, trying to make a decision about where to go with his own grief. Was there a particular inspiration for this story? My mom did the Tapestry LibLab at the same time I started studying composition at McGill and ever since we’ve talked about doing an opera together. We wanted to do a piece with high stakes – life and death. There has been a fair bit of the latter in our family over the past several years, so it seemed appropriate to explore these feelings of loss in our work together. How would you describe the musical vocabulary you use? Is it a departure? Yes and no…I’ve always approached my composition with a sense of drama in terms of conflict, tension, release, character – basically the same elements that one keeps in mind when writing a good script. However, in terms of the actual musical materials, it is a pretty radical departure. The writing is much more lyrical and motivic – dare I even say more tonal (!) – than my usual fare. Is there anything you’d like audiences to know? When I’ve mentioned to people that I’ve been working on a project with my mom, reactions tend to vary from ‘Aww, that’s cute’ to ‘Interesting – how do you do that without killing one another?’ The reality is that it’s been dramatically easier for us to work together on this opera than it was to live under the same roof. It’s more fun to nag each other about the placement of syllables than to fight about who’s taking out the garbage. 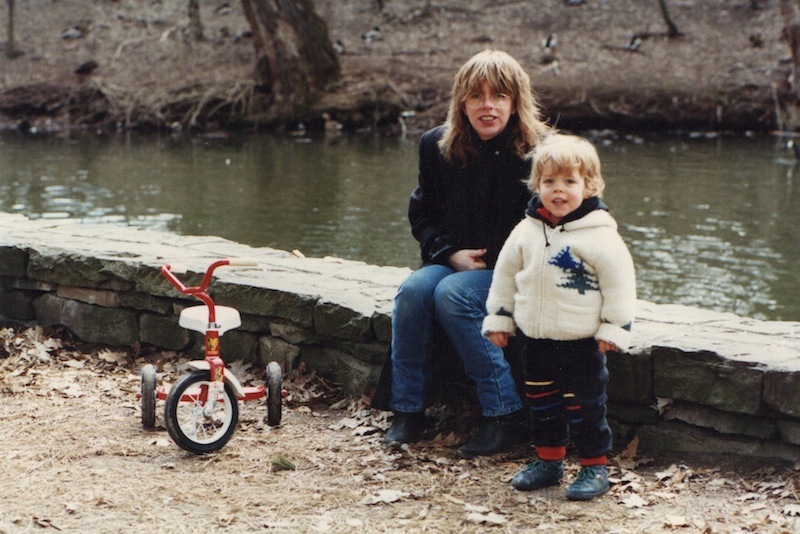 When I was really tiny, having my parents take me High Park was basically the coolest thing on the planet! What is your relationship to travelling? As much as I love to travel and explore and experience new people and places, I also have a real love for the City of Toronto. Every time I leave Toronto for an extended period of time I discover something new that I really love about our city. That said – my mom and I have probably logged close to 30,000 kilometers in the car together over the years and many of our best conversations happened on those trips. If you were a bike, what kind of bike would you be? I am one with my 2009 model Kona Dew. Do you wear a helmet? Almost always – but sometimes the ghost of Guy LaFleur calls on me to let the golden locks flow. How many killometers would you consider riding in one day? However many it takes to work off the previous night’s pints. Where in the world would you like to bike around if you could? Ibiza – nothing goes better with cycling than house music and the hot sun. Killer hills, though. Travelogue premieres in Toronto April 1st and 2nd at 8 pm the Arts and Letters Club, and is part of Toy Piano Composer’s Curiosity Festival. Tickets and show information HERE. Single tickets now available for only $15 in advance.